With a focus on quality and authenticity, the cruiser skateboards market is making a fresh start. All the news in our Skate Cruisers Retail Buyer’s Guide 2019 by SOURCE Skateboard Editor, Dirk Vogel. Now that skateboarding is recognized as a ‘real sport’, the question remains whether the 2020 Tokyo Games will bring a new wave of beginners on board – and into skate shops. Then again, does watching athletic ski jumpers soar hundreds of metres through the air on the telly make anyone want to pick up a pair of skis? Top-notch athletic performances are impressive, but to inspire mass participation, we may need something more laid back and relatable. A clean slate is exactly what’s needed to tell exclusive brand stories and build perceived value around cruisers again. In terms of price points, €109 is now the entry point for beginners completes from authentic brands offering quality deck constructions and hardware. 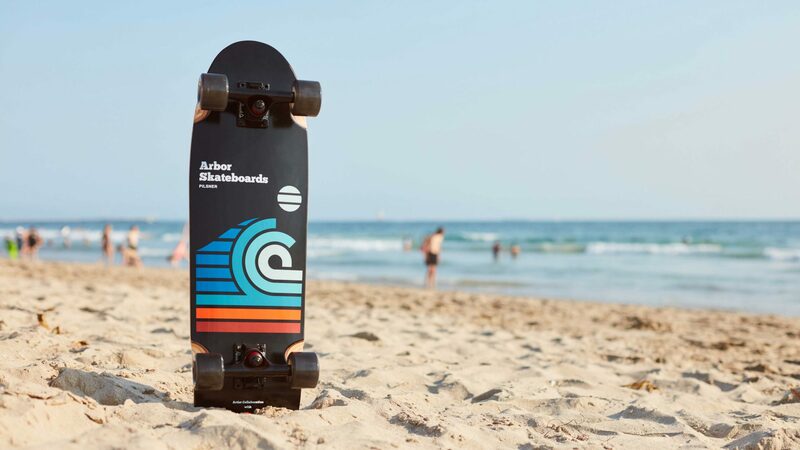 From there, it’s a wide-open field in 2019: More elaborate boards with inverted kingpins or surf-style trucks gravitate around €179 while premium boards from Arbor retail for €239, retro-style surf skates from YOW for €295, premium boards from Loaded between €300–400, and the high-end Sidewinder Carving boards by Sector 9 featuring Gullwing Double Kingpin Carving Trucks for €339. The trending cruiser for 2019 offers a stubby nose, wide belly and blocky tail next to wheel wells and curved rails to create a stable, pocketable ride. Looking for the main cause of this trend, Globe’s Senior Skateboard Designer, Dave Gitlin offered: “Wider shapes and more female participants may be going hand-in-hand in some cases. 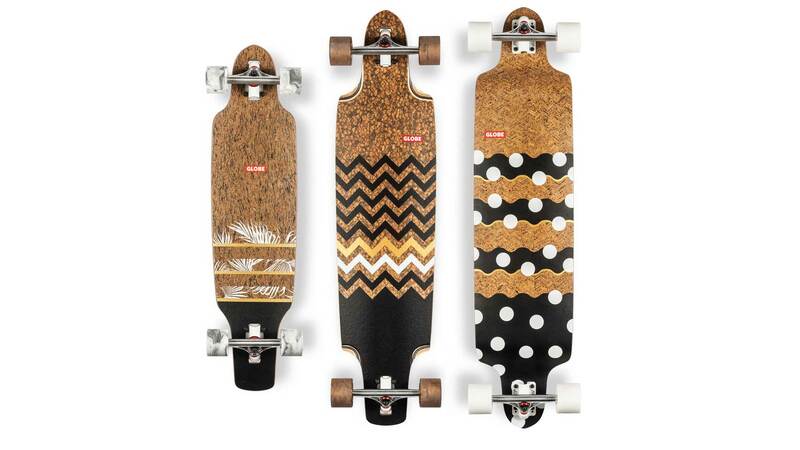 In skate decks, 8.25”-8.5” sizes have grown in popularity largely due to girls wanting a wider more stable board. That same mentality, along with a revival in old-school boards is causing us to look at widening our offering.” Penny developed a, “wider and more aggressive 32” board allowing for the rider to perform more technical skating.” Key models serving the wider cruiser trend next season include the Pocket Rocket (Arbor), Villa Belza (Flying Wheels), OP Surf Skate (Ocean Pacific), Ray Collins Five Mini Cruiser (Sector 9), Sunset and Lombard Cruiser (Mindless), Huntington Beach Surfskate (YOW), Dinghy Summit and Dinghy Creature (Landyachtz), Swallow (Carver), Beanbag (Lost), 30.5” Fat Cruiser (Kryptonics), and Koi (Dusters California). Arbor keeps creating an upscale aesthetic out of wood veneers paired with modernist graphics, including artist collabs with DOC. For Globe, it’s all about, “large reverse wood-burned art, cork textural inlays with bold patterns, and a few of our key styles are getting a full tiger-camo overhaul.” Flying Wheels is bringing in a major pop culture trend: tattoo style. “We are working close to artists and the main stories in our collections are tattoos, photo collage, flowers, retro and typo,” said Benoit Brecq at Flying Wheels/HOFF Distro. Mindless heads into 2019 with cool mandala graphics on pink wood veneers, while YOW features comic-style lightning bolts in the Power Surfing Series. One more thing: Top graphics paired with griptape stencilling will be a big theme in 2019! Next season’s deck constructions stay true to the proven formula of Canadian maple mixed with birch, and bamboo. 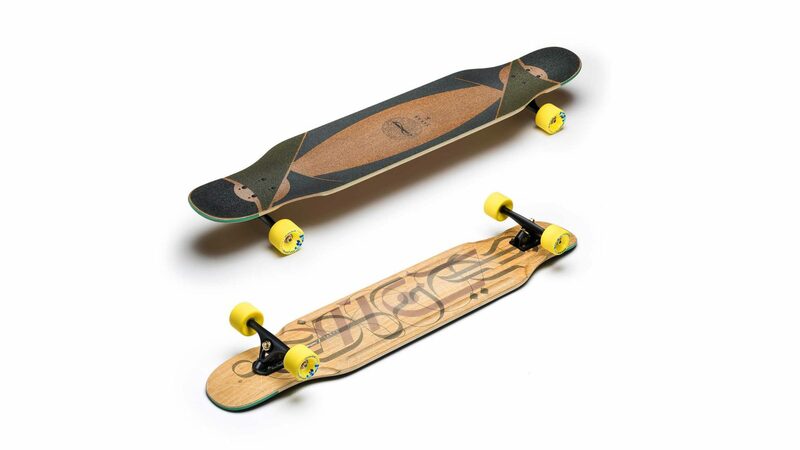 Loaded Boards is playing with natural materials like bamboo, basalt, and bio-resin in premium cruisers. Behind the scenes, Loaded is working with eco-friendly bamboo, bio epoxy and water-based finishes. Many brands such as YOW, Arbor, Carver, Globe, Flying Wheels and Mindless are also improving their carbon footprints and replacing glue with non-toxic alternatives – all without compromising on quality. 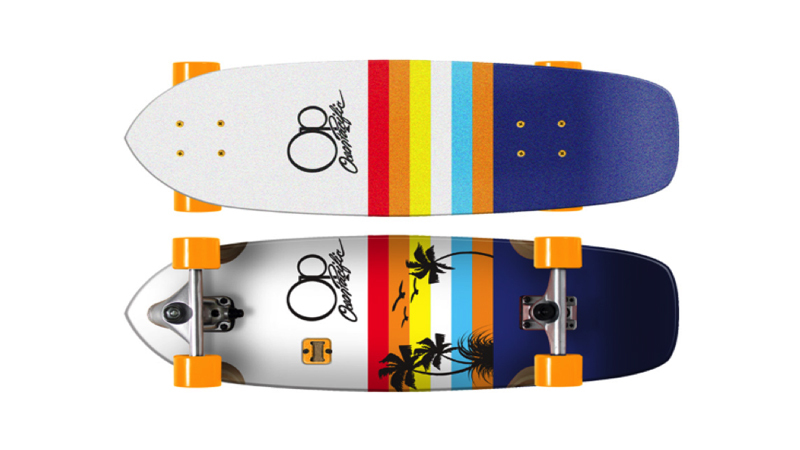 Landyachtz is expanding Hollowtech and planting one new maple tree for every board sold. In major news, Arbor is launching a fullly-fledged alternative to griptape, made from 30% recycled rubber for a padded ride: “Our Collaboration with Vibram, using their INVRS material as an alternative grip solution has already been generating a buzz around it, being chosen as Gear Junkie’s Best in Show at Outdoor Retailer this summer.” Over at YOW, the Huntington Beach surfskate is, “the first surfskate to feature a cork top instead of griptape. Perfect for barefeet sessions and beach lifestyle.” The best part: Both inventions won’t scratch your feet during surf-style sessions. Brands without their own hardware departments saddle up with quality manufacturers, including Paris, Caliber, and even Indy trucks as well as Cadillac Wheels. Speaking on rider demand, Benoit at HOFF said: “For trucks, inverted kingpin and forged trucks are the trends for technical riders, but since last year the surfing trends is exploding with new trucks technologies to create new truck variations.” And while bright-coloured wheels are all nice and retro, look for more black wheels making their way into the streets next season. Women aren’t the only growth market for cruisers – kids are next in line. Nate at Arbor is proud to introduce, “the Seed Series; a line of street shapes meant for the younger ripper to learn on and grow with. Our Certified Arbor Completes in the Seed Series feature Arbor Revert 90A Wheels, ABEC 5 Bearings and Ace Trucks, making it a quality component build at a very competitive price.” Look for more mini and kids cruisers in 2019 selection, as a new generation explores the joy of casual cruising.